The Report Preview page displays reports that are generated in your Financials software. This page allows you to change the Report Preferences, navigate, export, and print the report. The Report Preferences vary for each report and contain certain drop-down lists, check boxes, and other options that allow you to customize the report. Refer to each specific report Help page for the detailed information pertaining to that report. •Click the Report Preferences bar to change the Filters or Options for a report. •Click the Clear Preferences link to reset all the Filters and Options to their default settings for a report. •After making changes to the Report Preferences, click the Run Report button to generate a new iteration of the report. The Previous and Next icons allow you to navigate through multiple iterations of the same report. For example, if you change a Filter such as a date range and then click the Run Report button, a second iteration of the same report is generated. The Previous icon turns green indicating that there is at least one previous iteration of the report. Click the Previous icon to view the previous iteration of the report and then click the Next icon to view a newer iteration of the report. After closing the report, all iterations of the report are cleared. The Page options allow you to navigate through the pages of your report. •Click the First Page icon to navigate to the first page of the report preview. •Click the Previous Page icon to navigate back one page on the report preview. •Click the Next Page icon to navigate forward one page on the report preview. •Click the Last Page icon to navigate to the last page of the report preview. •The Current Page field displays your current page number and also the total number of pages in that section or report. The Export options allow you to save the previewed report in a number of formats. 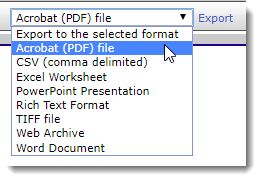 This is particularly helpful for creating PDF documents which can then be emailed or saved for future reference. Select a format from the drop-down list and then click the Export link. After clicking the Export link, the file automatically downloads in the format you selected. The following formats are available on the drop-down list. NOTE: The formatting of the export file may vary depending on the report and the Export option selected. There are a few reports in the General Ledger that have been specifically coded for an enhanced Excel Worksheet export file. These reports include: Statement of Financial Position, Budgeted Financial Statement, Designated Fund Summary, Financial Spreadsheet, and Trial Balance Worksheet (and their corresponding Special Reports). The Switch to interactive view icon is seldom used and simply changes the way the report displays on the page. For example, if you are viewing the Financial Spreadsheet and want view the width of the report on one page, switch to the interactive view. The interactive view does not affect how the report prints or is exported. It is only an option for viewing the report. Click the Print icon or press "Ctrl + P" to print the report. The Document Map icon is only available for specific reports that display multiple sub-reports on the Report Preview page. Clicking this icon allows you to toggle between showing or hiding the document map. The document map displays on the left-side of the Report Preview page with each sub-report listed as a blue link. The Chart of Accounts report with page breaks for Funds or Departments is an example of a report that displays the document map. Click the Close Report button to leave the report or simply navigate to another page. You are not required to close the report. Navigating to another page automatically closes the report.